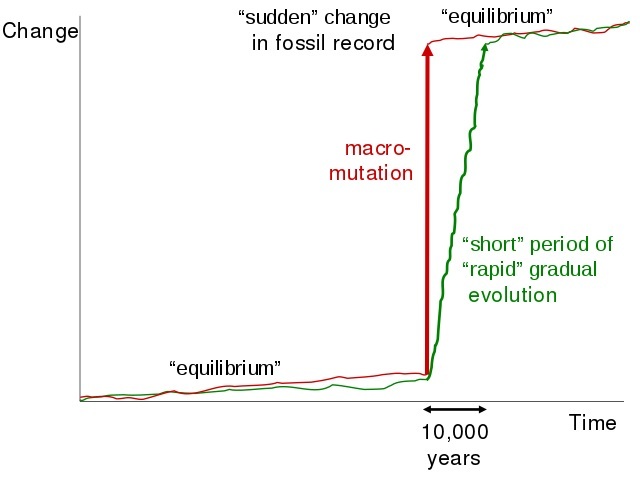 Punctuated equilibrium model is a theory of how species form which suggests that groups of organisms experience long periods of stasis, or relative stability, and then periods of rapid speciation. The punctuated equilibrium model suggests that speciation occurs relatively quickly, then finds an equilibrium. There are a couple of different ways this can happen. As seen in the graphic below, the theory of punctuated equilibrium can proceed through two potential pathways. In the first pathway a macro-mutation causes a massive change within a species, allowing it to quickly proliferate, but in a new form. The mutant quickly becomes its own established species. This can be seen in the red line. The green line shows the second method, in which the change happens as a series of rapid but small changes. This method is similar to the theory of gradualism, but is supposedly much faster, followed by intermittent periods of equilibrium. When looking at the fossil record, it seems that some species seem to just pop up from nowhere. In one layer, the species does not exist, and in the next layer, it does. This is usually considered weak evidence for several reasons. First, the fossil record is incomplete. While we have found many species, we can never truly know all the species that ever existed. Charles Darwin dismissed the inconsistency of the fossil record, preferring to think of evolution as a more gradual process. This aside, there is more evidence for punctuated equilibrium. For instance, scientists have showed that sibling species look identical, but diverged from each other millions of years ago. 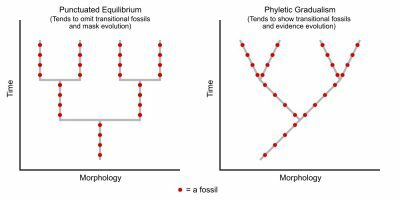 This suggests that the morphological stability in the fossil record may not correspond to the actual genetic change taking place. Further evidence for periods of stasis has been shown in studies of stabilizing selection. Though the genetics of organisms are constantly changing, certain evolutionary pressures may keep a population stable for a long period of time. Then, as these environmental pressures changed rapidly, the species within would also have to change. The theory of gradualism is the idea that over time species accumulate small changes that slowly lead to new forms. Evidence for this theory includes the facts that mutations in the genetic code occur at a reliable rate. Punctuated equilibrium, in its most modern interpretation, is a form of gradualism. The difference can be seen in the image below. In gradualism, the changes happen at a consistent rate over time. In the punctuated equilibrium theory, rapid change happens in a short amount of time. 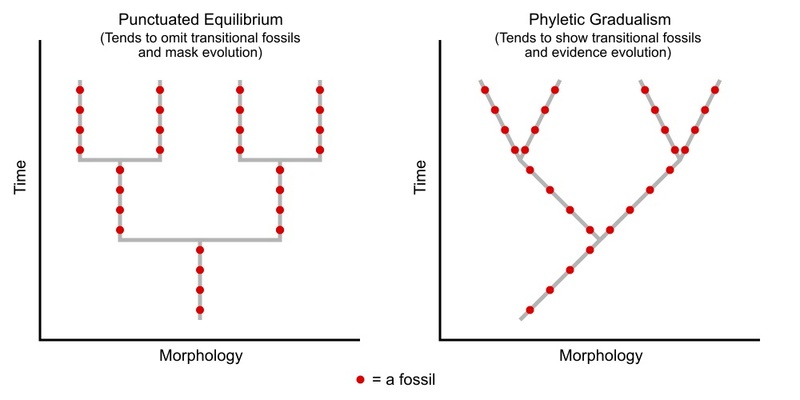 The red dots on the diagram represent hypothetical fossils, which would support each theory. Unfortunately, actual fossil evidence in somewhere in between these two models. Looking at the evolutionary history of insects is rather easy. They are abundant, and pretty much have been since they first evolved from ocean-dwelling crustaceans. Because of this, they have an ample fossil record. Looking between different large groups of insects, you can clearly understand the different insect lines that have evolved. These large groups, such as beetles, flies, ants, and fleas have clearly distinct evolutionary lines. Each of these lines originated rather quickly in evolutionary history, but has retained many of the base characteristics over time. This makes insects a good example of punctuated equilibrium. But, insects also show the downside of punctuated equilibrium. Consider how many species on insect there are. Millions and millions of species. Yet, we know for a fact that these small, soft-bodied creatures do not preserve well in the fossil record. Therefore, when we start looking at the differences between individual species, it is impossible to know how quickly the change occurred. For example, a fly and an ant have a common ancestor. Did this common ancestor deviate into two separate, functional species in one generation? Likely, the answer is no. It probably took many generations and many different forms to get there. This is where the confusion about punctuated equilibrium comes in. The word “punctuated” is typically interpreted to mean immediate. This clearly cannot always be the case. If it simply means rapidly, the punctuated equilibrium theory may have more merit. Human evolution is often described as a number of radiations of different populations out of Africa. 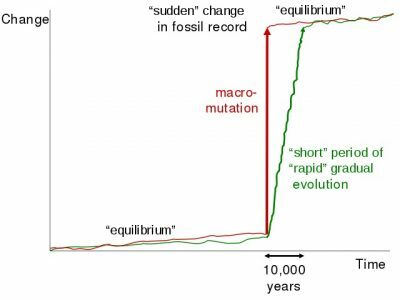 This view of human evolution can aid in understanding the importance of geography on the theory of punctuated equilibrium. The most widely accepted theory of human evolution is that some sort of ancestral human originated in Africa, then slowly dispersed to the rest of the globe. This theory is supported by fossil and genealogical evidence. Consider the many different forms and races of humans. Now consider that all of these races are the same species, and that they likely arose from an original population in Africa. As they migrated out of Africa, the environment changed. In a relatively short time, this gave rise to many different human forms, largely reflective of the environment they had to endure. This gives credit to the theory of punctuated equilibrium. However, modern genetic studies have documented the vast genetic variety of the human species. While we all have the same number of chromosomes, the pieces of those chromosomes can be very different. Yet, compared to any other species, we are instantly recognizable. This also supports the idea that it takes large changes to the genetic code to really change an organism, supporting punctuated equilibrium. Many critics of punctuated equilibrium state that the theory does not correctly capture the nature of what is happening. Punctuated makes it sound like the change is immediate, and that there is no buildup. Equilibrium suggests that outside the times of rapid change, there is on change at all. Critics of punctuated equilibrium typically revolve around these arguments, though modern interpretations of the theory resolve these issues. In general, the theory can be accepted that the periods of stasis are really just periods of stabilizing selection. Though the genetics are changing, the organisms are stabilized by natural selection. The punctuated changes have been seen in microevolution, which organisms changing their form in only a few generations. 1. Which of the following gives supporting evidence to the theory of punctuated equilibrium? A. A river carves out a valley, little by little every day over thousands of years. B. A pair of albino sparrows gets blown by a storm to a small island. They have many offspring, which are also all white, and establish a new species. This species has existed for thousands of years. C. Horseshoe crabs have remained the same for hundreds of millions of years. 2. How can punctuated equilibrium be possible, on a genetic level? B. It is not possible, genetically. All genetic changes are slow. C. Only many mutations over time can lead to a new species. 3. Dinosaur fossils are found. Then a small dinosaur fossil with feathers. Then a scientist looks out of his office window, and sees a bird. Is this evidence of punctuated equilibrium? Diamond, J. (1999). Guns, Germs, and Steel: The Fates of Human Societies. New York: Norton & Company, Inc.
Feldhamer, G. A., Drickamer, L. C., Vessey, S. H., Merritt, J. F., & Krajewski, C. (2007). Mammology: Adaptation, Diversity, Ecology (3rd ed.). Baltimore: The Johns Hopkins University Press.